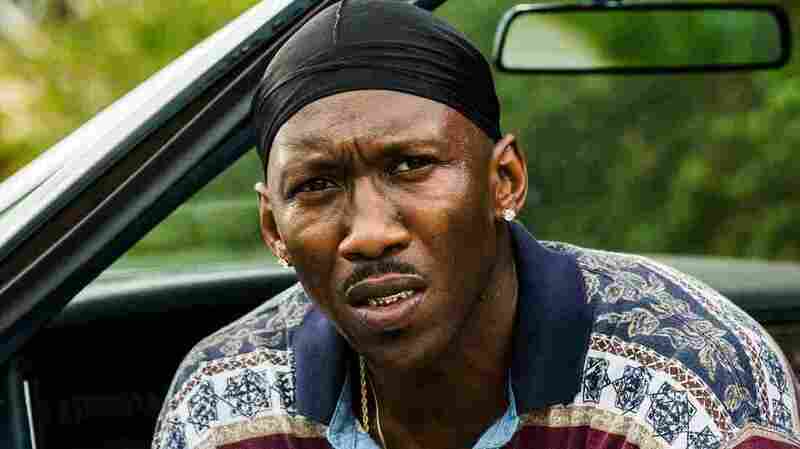 In 'Moonlight,' Actor Mahershala Ali Found Characters He Recognized Ali has earned an Oscar nomination for his performance as Juan, a drug dealer who becomes an unlikely father figure to a boy who is being bullied at school and neglected at home. Mahershala Ali has been nominated for an Academy Award for his performance in Moonlight. In the recent film, Moonlight, Mahershala Ali plays an unlikely father figure to a quiet young African-American boy named Chiron. At school, Chiron is bullied. At home, he is neglected by a mother who is addicted to crack. Ali's character, Juan, is a drug dealer who takes Chiron under his wing in an attempt to provide him with some stability. Ali, whose performance earned him an Oscar nomination for best supporting actor, tells Fresh Air's Terry Gross that he knew men like Juan growing up. "Those were the guys who had access and had money, and ... some felt responsible to create opportunity for other people," he says. "When I read Moonlight ... I was blown away by seeing characters from my own life and people that I recognized on the page." In January, Ali won the Screen Actors Guild award for Outstanding Performance by a Male Actor in a Supporting Role. In a moving acceptance speech, he said, "What I've learned from working on Moonlight is: We see what happens when you persecute people — they fold into themselves." Though he was never treated the way Chiron was, Ali says he knows what it is to be on the outside. "There were periods of time where I didn't feel understood," he says. "There were very few people around me that I felt like they really got me." We were moving around a lot, so I couldn't really hold on to a certain set of friends. That was a little bit difficult, and also ... my father lived in New York. So I was going out there in the summers and meeting really interesting people. ... And so I would go to the big city and watch these people performing on stage and doing television and films and then I would go back to Hayward [Calif.] and it just suddenly felt that much smaller. ... I had this hyper-awareness of how much larger the world was. I went to a mosque in Philadelphia with her ... and I just had such a strong reaction to the prayer. I felt really grounded at that time, and so to be in this prayer and the imam is doing the prayer in Arabic, and I don't understand a word of Arabic, but I just remember these tears just coming down my face, and it just really connecting to my spirit in a way that felt like I needed to pay attention to that. You folded into yourself, because people were looking at you and recognizing you as being the culprit, even though — look, I'm American, I don't believe the teachings of Islam justify those actions. I feel like those acts are un-Islamic. So to see that happen and somebody do that in the name of God, and the religion that you practice, it hurts your heart so deeply, because it's such a misrepresentation of the faith. And you're an American, so you're hurt that other American citizens have been hurt. But you end up having to shoulder the shame for something that you don't even believe. I think that there's this perception that Muslims really do condone and believe that this violence is OK and that the faith teaches it — but it doesn't. So there's a lot of years where Muslims have dealt with having to make themselves very small and not disrupt the flow and make sure you're not noticed. Eventually I found out that I was on a watch list. ... This is 2003 [or 2004]. ... After the Patriot Act, I would always get my financial packages in the mail and they would just be opened. It was like, "What is going on here?"... On that watch list they would be like, "Yeah your name matches the name of a terrorist or someone that they're watching." I was like, "What terrorist is running around with a Hebrew first name and an Arabic last name? Who's that guy?" I wanted to get that Division I scholarship and play ball and go to school for free, and I was always about getting to that next step. ... I was always ahead of myself in some way, shape or form, and trying to envision how to get further along and closer to fulfilling that dream of being free and having creative agency, so to speak. At a certain point basketball became the thing I was doing most, but it was really in my periphery. It was really a focus on how to, in some ways, keep moving in this direction towards something that allowed me to express myself in a way that sports didn't. Once you graduate is when you start to find yourself looking at the information in the audition breakdown and it says, "tall, black" or "African-American, built such-and-such" and you start seeing these character descriptions and seeing that, "Oh, you're only going in for the ones that are described as your look." So if anything, in my mind, I never wanted to accept that and so I have always fought against that.